If you wish to user eFolio and wordpress to deliver ‘tasters’ of your course, or even deliver an entire module there are a number of interactive features you can add to your pages. Simply copy and paste the webpage address of the youtube or vimeo video. no special embed code required. Add any mp3 file and allow students to play in their browser. Add multiple choice questions anywhere on a page. The lion (Panthera leo) is one of the four big cats in the genus Panthera and a member of the family Felidae. With some males exceeding 250 kg (550 lb) in weight, it is the second-largest living cat after the tiger. Wild lions currently exist in sub-Saharan Africa and in Asia (where an endangered remnant population resides in Gir Forest National Park in India) while other types of lions have disappeared from North Africa and Southwest Asia in historic times. Until the late Pleistocene, about 10,000 years ago, the lion was the most widespread large land mammal after humans. They were found in most of Africa, across Eurasia from western Europe to India, and in the Americas from the Yukon to Peru. The lion is a vulnerable species, having seen a major population decline in its African range of 30–50% per two decades during the second half of the 20th century. Lion populations are untenable outside designated reserves and national parks. Although the cause of the decline is not fully understood, habitat loss and conflicts with humans are currently the greatest causes of concern. Within Africa, the West African lion population is particularly endangered. The tiger (Panthera tigris) is the largest cat species, reaching a total body length of up to 3.3 m (11 ft) and weighing up to 306 kg (670 lb). It is the third largest land carnivore (behind only the polar bear and the brown bear). Its most recognizable feature is a pattern of dark vertical stripes on reddish-orange fur with a lighter underside. It has exceptionally stout teeth, and the canines are the longest among living felids with a crown height of as much as 74.5 mm (2.93 in) or even 90 mm (3.5 in). In zoos, tigers have lived for 20 to 26 years, which also seems to be their longevity in the wild. They are territorial and generally solitary but social animals, often requiring large contiguous areas of habitat that support their prey requirements. This, coupled with the fact that they are indigenous to some of the more densely populated places on Earth, has caused significant conflicts with humans. 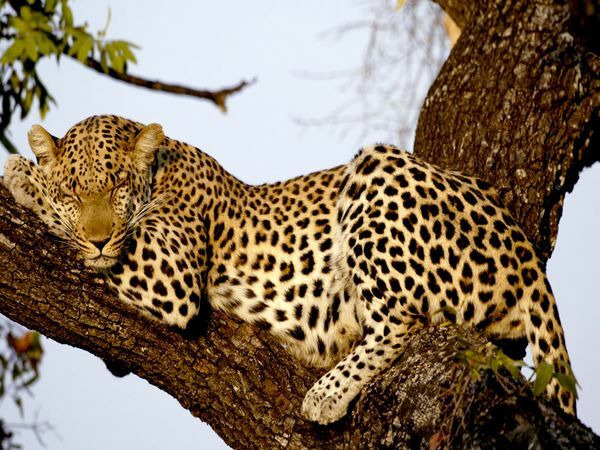 The leopard (Panthera pardus) is a member of the Felidae family with a wide range in some parts of Africa and tropical Asia, fromSiberia, South and West Asia to across most of sub-Saharan Africa. It is listed as Near Threatened on the IUCN Red List because it is declining in large parts of its range due to habitat loss and fragmentation, and hunting for trade and pest control. It is regionally extinct inHong Kong, Singapore, Kuwait, Syrian Arab Republic, Libya and Tunisia. The lion (Panthera leo) is one of the four big cats in the genus Panthera and a member of the family Felidae. With some males exceeding 250 kg (550 lb) in weight, it is the second-largest living cat after the tiger. Wild lions currently exist in sub-Saharan Africa and in Asia (where an endangered remnant population resides in Gir Forest National Park in India) while other types of lions have disappeared from North Africa and Southwest Asia in historic times. Until the late Pleistocene, about 10,000 years ago, the lion was the most widespread large land mammal after humans. They were found in most of Africa, across Eurasia from western Europe to India, and in the Americas from the Yukon to Peru. 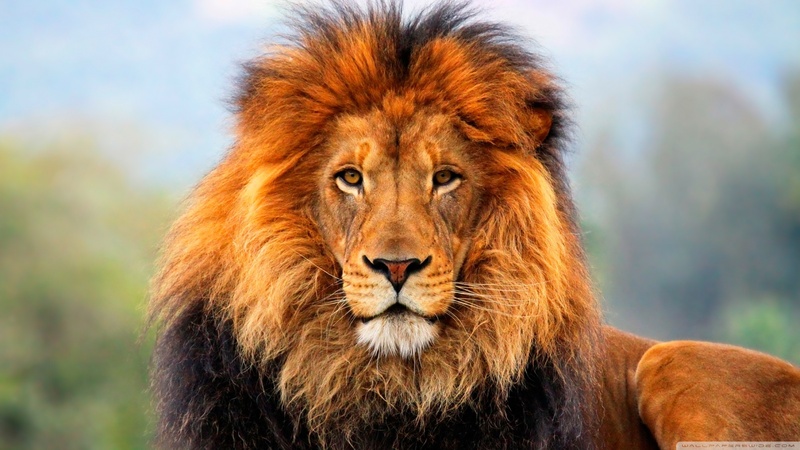 The lion is a vulnerable species, having seen a major population decline in its African range of 30–50% per two decades during the second half of the 20th century. Lion populations are untenable outside designated reserves and national parks. Although the cause of the decline is not fully understood, habitat loss and conflicts with humans are currently the greatest causes of concern. Within Africa, the West African lion population is particularly endangered. The tiger (Panthera tigris) is the largest cat species, reaching a total body length of up to 3.3 m (11 ft) and weighing up to 306 kg (670 lb). It is the third largest land carnivore (behind only the polar bear and the brown bear). Its most recognizable feature is a pattern of dark vertical stripes on reddish-orange fur with a lighter underside. It has exceptionally stout teeth, and the canines are the longest among living felids with a crown height of as much as 74.5 mm (2.93 in) or even 90 mm (3.5 in). 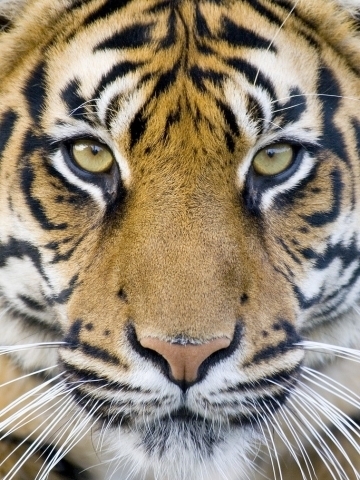 In zoos, tigers have lived for 20 to 26 years, which also seems to be their longevity in the wild. They are territorial and generally solitary but social animals, often requiring large contiguous areas of habitat that support their prey requirements. This, coupled with the fact that they are indigenous to some of the more densely populated places on Earth, has caused significant conflicts with humans. The leopard (Panthera pardus) is a member of the Felidae family with a wide range in some parts of Africa and tropical Asia, fromSiberia, South and West Asia to across most of sub-Saharan Africa. leopardIt is listed as Near Threatened on the IUCN Red List because it is declining in large parts of its range due to habitat loss and fragmentation, and hunting for trade and pest control. It is regionally extinct inHong Kong, Singapore, Kuwait, Syrian Arab Republic, Libya and Tunisia. 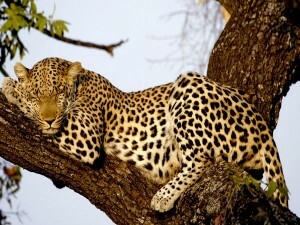 The leopard /ˈlɛpərd/ is the smallest of the four “big cats” in the genus Panthera. Compared to other members of the Felidae, the leopard has relatively short legs and a long body with a large skull. It is similar in appearance to the jaguar, but is smaller and more slightly built. Its fur is marked with rosettes similar to those of the jaguar, but the leopard’s rosettes are smaller and more densely packed, and do not usually have central spots as the jaguars do. Both leopards and jaguars that are melanistic are known as black panthers.